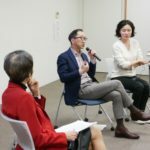 In addition to joining the discussion at the SINCA session, two guestsI-George Nishiyama of Wall Street Journal Japan and Miyuki Inoue of Asahi Shimbun- were kind enough to give me the interview on Friday, January 25. I heard interesting comments regarding how they see the changing landscape of media and the transformation of industry. Here are video of interviews. You can watch them on our website, under the Interview-Expert Interview section. Everybody’s life is a poetry..